Got unsecured classified material? HRC and NObama do. For those of you not privy to the underhanded way in which “OUR EMPLOYEES” take care of one another, the document dump that occurred last Friday of a long holiday weekend is yet another example of collusion from self-serving entities that have a lot to lose if kicked to the curb. Three violations, three different outcomes. I am not at a loss for words for the CONTINUED CORRUPTION that violates everything that is right and good with our country. Remember this reaches to the very highest levels of our government. 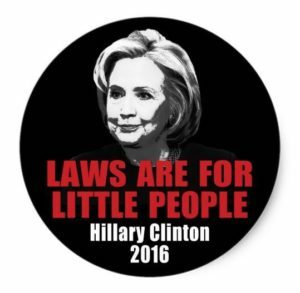 Hildabeast remains a free woman even through the myriad violations of the oath she took as Secretary of State. But this should have been the straw that broke the beasts back, but it did not, why? Because if hildabeast went down it would’ve exposed NObama as colluding with her via the same “unsecure” server/email/phones. The die was cast long before she made an appearance before TreyGowdy and congress. THIS is why she continued down the path of deny, deny, deny at all costs. She KNEW going into this testimony that she was home free. This is at the apex of treason, it is one thing to knowingly communicate via unsecure means at this level, but the severity increases exponentially whenever anyone colludes with another to cover up said violation(s). This is yet another example of EVERYTHING that is wrong with our ESTABLISHMENT EMPLOYEES!! This may just back fire on the “cabal of Clinton corruption” that has infested our country for far too long. PLEASE PEOPLE WAKE UP, rouse your family and friends and show them the light when it comes to this cancer that has infested WASHINGTON D.C. for far too many decades. Where are all the hildabeast supporters?? Is THIS what you want your children and grand-grandchildren to aspire to? This wanton violation of everything that is right and good about our country is without a doubt going to negatively affect their futures. Lastly….name “ONE” thing this rotten to the core witch has done to the positive in “ALL OF HER YEARS” of civil service. Just one please…..
Lastly to her supporters, Quid Pro Quo; HOW does a government employee amass a personal net worth of over 250 MILLION DOLLARS when the majority of their adult life has been in politics? 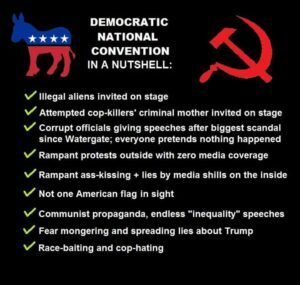 IF THIS does not wake the comatose people of our Republic up, nothing will! If that is the case, I advise you to stock up on H2O, dry food stuffs, brass and lead and learn a bartering skill that you can use so you may remain a breathing and vibrant human being. To all my fellow “spooks” and former/current holders of a Top Secret SI security clearance, who are/should be well versed in the following. FYI to the rest. 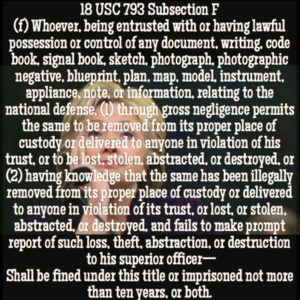 Under 18 USC 793 subsection F of the Espionage Act, if a security clearance holder allows material to be “removed or abstracted from its proper, secure location” through “gross negligence” and does not attempt “to make prompt report of such loss, theft, abstraction, or destruction to his superior officer,” that could lead to charges. She is in direct violation of the aforementioned Espionage act and/or 1924 of the Criminal Code of the United States. The bottom line is “at the very least” she did not properly inventory said classified material. She did not “return” said classified material at the end of her term as secretary of state. That is all that is needed to charge her and convict her. And this does not even involve her “suspicious server” being in her basement, backed up by an outside company and backed up on the cloud. The greenest military member who possesses a Top Secret SCI KNOWS better than this. Regardless of her thespian like performance, she violated the most basic edict (as described above) that all holders of a security clearance (and especially to those that hold a Top Secret SI clearance) must adhere to 24/7-365 with NO exceptions. 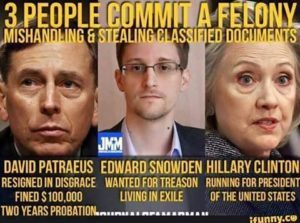 I know for a fact, that if “ANYONE” violated just 1% of what she did when entrusted with classified material and the security protocols that go with said classified materials, they would (if convicted/found guilty in a court martial) be sent “post haste” straight to Ft. Leavenworth KS. Once processed they would be trained in the fine art of making big rocks into little rocks. There is no room for error in this most important area of national security, the republics future hangs in the balance whenever classified material is concerned. Accountability, responsibility, integrity and honor, in this day and age seem to have become archaicterms that have no real meaning to many people (especially politicians). This has been especially damaging to our younger generations coming up who are being taught that you can simply pass the buck and deny culpability at all costs, no matter the seriousness of the crime/violation. This is dangerous ground being tread by our society, the more it drifts away from the truth, the more it moves away from reality, the farther it strays from its Constitutional roots the closer it gets to its hellish end. NObama is just as culpable in this travesty of unprecedented damage to the very security of our country and its future. He is ready to hand over the “hammer and sickle” to hildabeast, whom if elected will finish pounding the last cancerous nails of Marxism into the coffin that is our Republic. Please do not stand by and allow that to come to pass, instill integrity and honor to your children/grandchildren and family, send them out into the world prepared to deal with all of its harshness and pratfalls. You do them ZERO favors hiding them from the truth. How much longer are “We the People,” I.E. the bosses, going to allow politicians, I.E. “our employees,” to live above the law? Previous articleCultural Marxism has infested our country, young people I.E. SENSITIVE LITTLE SNOWFLAKES and far too many young ‘men’ have been completely emasculated in the process.